2. Department of Gastroenterology and Hepatology, Osaka Red Cross Hospital, Osaka, Japan. Aims: We sought to compare the effects of FIB-4 index and aspartate aminotransferase to platelet ratio index (APRI) on hepatocellular carcinoma (HCC) incidence in chronic hepatitis B (CHB) patients undergoing entecavir (ETV) therapy. Patient and methods: A total of 338 nucleosides analogue therapy naïve CHB patients initially treated with ETV were analyzed. The optimal cutoff points in each continuous variable were determined by receiver operating curve (ROC) analysis. The effects of FIB-4 index and APRI on HCC incidence were compared using time-dependent ROC analysis and factors linked to HCC incidence were also examined using univariate and multivariate analyses. Results: There were 215 males and 123 females with the median age of 52 years and the median baseline HBV-DNA level of 6.6 log copies/ml. The median follow-up interval after the initiation of ETV therapy was 4.99 years. During the follow-up period, 33 patients (9.8%) developed HCC. The 3-, 5- 7-year cumulative HCC incidence rates in all cases were 4.4%, 9.2% and 13.5%, respectively. In the multivariate analysis, FIB-4 index revealed to be an independent predictor associated with HCC incidence, while APRI was not. In the time-dependent ROC analyses for all cases and for all subgroups analyses stratified by viral status or cirrhosis status, all area under the ROCs in each time point (2-, 3-, 4-, 5-, 6-, and 7-year) of FIB-4 index were higher than those of APRI. Conclusion: FIB-4 index rather than APRI can be a useful predictor associated with HCC development for CHB patients undergoing ETV therapy. Keywords: Chronic hepatitis B, Entecavir, Carcinogenesis, FIB-4 index, APRI. FIB-4 index and aspartate aminotransferase (AST) to platelet ratio index (APRI), which are simple and noninvasive liver fibrosis markers, were originally developed for predicting the degree of liver fibrosis in patients with chronic hepatitis C. Their usefulness in patients with CHB have also been verified. A recent meta-analysis for the usefulness of FIB-4 index and APRI in CHB indicated that FIB-4 index and APRI can identify CHB-related fibrosis with a moderate sensitivity and accuracy. Another meta-analysis of FIB-4 index in CHB presented that FIB-4 index is helpful for predicting significant fibrosis and LC in CHB patients. Thus, these biomarkers can provide useful clinical information of CHB-related liver fibrosis for clinicians. On the other hand, in terms of clinical efficacy of FIB-4 index and APRI on CHB-related liver carcinogenesis, a Korean study reported that high FIB-4 index was a highly predictive factor for carcinogenesis in 986 Korean HBsAg carriers aged 40 years or more. In addition, Hann, et al. demonstrated that APRI might be a predictor of HCC development in CHB patients irrespective of the presence or absence of LC. 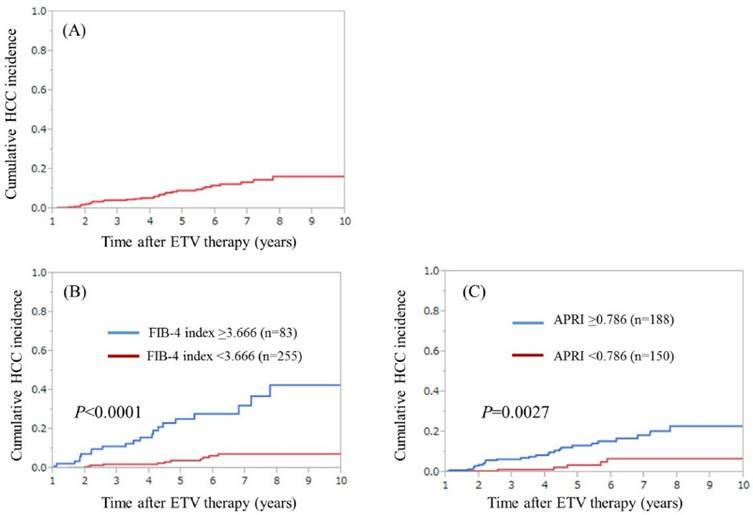 However, to the best of our knowledge, the effects of FIB-4 index and APRI on liver carcinogenesis in CHB patients receiving ETV therapy have not been fully examined. As described above, since ETV is a first line NA for the treatment of CHB, clarifying these issues are essential problems. The aims of the current study were therefore to compare the effects of FIB-4 index and APRI on liver carcionogenesis in CHB patients undergoing ETV therapy. From April 2006 until February 2015, a total of 363 CHB patients who initially received ETV therapy and no apparent evidence of HCC on imaging findings were admitted to the Department of Gastroenterology and Hepatology, Osaka Red Cross Hospital, Osaka, Japan and the Division of Hepatobiliary and Pancreatic disease, Department of Internal Medicine, Hyogo College of Medicine, Hyogo, Japan. All are NA treatment naïve and they had detectable HBs antigen for more than six months. In addition, all subjects had no clinical evidence of detectable hepatitis C virus antibody, and no apparent evidence of alcoholic abuse or drug-induced liver injury. In baseline data in analyzed subjects, we adopted data at the start of ETV treatment. All patients were initially treated by ETV with a daily dose of 0.5 mg. ETV therapy for CHB was chosen based on the decision of each attending physician. Of these patients, subjects with HCC development within one year after the start of ETV therapy (n=14), those with observation period after the start of ETV therapy less than one year (n=4) and insufficient baseline clinical data (n=7) were excluded from the current analysis. Thus, the present study cohort was comprised of a total of 338 CHB patients. All analyzed cases were treated by ETV for at least one year. LC was diagnosed pathologically and/or radiologically. In cases without liver biopsy, LC was diagnosed through findings of imaging studies: clinical characteristics indicative of portal hypertension such as varices, ascites or splenomegaly and a shrunken, deformed and nodular liver as noted on liver imaging. The main outcome measure in our study is development of HCC. HCC was diagnosed based on Japanese guidelines. For subjects with atypical imaging findings, ultrasound-guided tumor biopsy was performed for histological evaluation. Based on the previous reports, FIB-4 index was calculated as follows: age (years) × AST (IU/l) /platelet count (×109/l) ×√ALT (IU/l)) and APRI score was calculated as follows: (AST/upper limit of normal)/platelet count (expressed as platelets × 109/l) × 100. [29, 30] The effects of FIB-4 index and APRI on HCC incidence were compared using time-dependent receiver operating characteristics (ROC) analysis (described later) and factors linked to HCC incidence were examined using univariate and multivariate analyses. This study was approved by ethics committees in each hospital and the present study protocol strictly adhered to all of the provisions of the Declaration of Helsinki. Blood testing for HBs antigen and HBe antigen and HBe antibody were performed using commercially available kits (Abbott or Fujirebio, Tokyo, Japan). We measured HBV-DNA load by using the COBAS Amplicor HBV Monitor Test (Roche Diagnostics, Tokyo, Japan: linear range of detection; 2.6-7.6 log copies/ml) or by using the COBAS Taqman HBV Test v2.0 (Roche Diagnostics, Tokyo, Japan: linear range of detection; 2.1-9.0 log copies/ml). Time interval for HCC incidence was defined as duration from the date of the initiation of ETV therapy until the date of first confirmed HCC on imaging findings. In patients without HCC development, observation period was calculated as the time from the date of the initiation of ETV therapy to the last follow-up date. Data are presented as median (range) unless otherwise stated. We treated variables with P<0.05 as statistically significant variables. Statistical analysis was performed by using the JMP 11 (SAS Institute Inc., Cary, NC). The baseline characteristics for all subjects (n=338) in this study are presented in table 1. There were 215 males and 123 females with the median age of 52 years (range, 18-82 years) and the median baseline HBV-DNA level of 6.6 log copies/ml (range, 2.1-9.0 log copies/ml). Ninety-one patients (26.9%) had LC on radiologic findings, while 163 patients (48.2%) had HBe antigen positivity. The median (range) follow-up interval after the initiation of ETV therapy was 4.99 years (1.03-9.98 years). In terms of viral response to ETV therapy, 239 patients (70.7%) had HBV-DNA level <2.6 log copies/ml at six months from the start of ETV therapy. In this study, FIB-4 index ranged from 0.233 to 55.528 (median, 1.983), while APRI ranged from 0.061 to 28.977 (median, 0.900). Data are expressed as number or median value (range). AST; aspartate aminotransferase, ALT; alanine aminotransferase, HBV; hepatitis B virus. In ROC analyses for HCC incidence at 5-year (almost equal to median follow-up period for the entire cohort), optimal cutoff point in FIB-4 index was 3.666 (AUROC=0.768; sensitivity, 68.0%; and specificity, 80.47%), whereas that in APRI was 0.786 (AUROC=0.629; sensitivity, 84.0%; and specificity, 43.2%). We defined patients with FIB-4 index ≥3.666 as high FIB-4 index group (H-FIB group, n=83) and patients with FIB-4 index <3.666 as low FIB-4 index group (L-FIB group, n=255). Similarly, we defined patients with APRI ≥0.786 as high APRI group (H-APRI group, n=188) and patients with APRI <0.786 as low APRI group (L-APRI group, n=150). Univariate analysis identified the following variables as significantly linked to HCC development for all cases: age ≥58 years (P<0.0001); presence of LC (P<0.0001); serum albumin ≥3.9 g/dl (P=0.0325); total bilirubin ≥1.1 mg/dl (P=0.0043); platelet count ≥14.1 ×104/mm3 (P<0.0001); APRI ≥0.786 (P=0.0027); FIB-4 index ≥3.666 (P<0.0001); pretreatment alpha-fetoprotein (AFP) ≥13.2 ng/ml (P=0.0036); and pretreatment HBV-DNA ≥7.4 log copies/ml (P=0.0098). (Table 2) The odds ratios (ORs) and 95% confidence intervals (CIs) calculated using multivariate analysis for the nine factors with P<0.05 in univariate analysis are presented in table 2. Age ≥58 years (P=0.0003), presence of LC (P=0.0167), FIB-4 index ≥3.666 (P=0.0374), pretreatment AFP ≥13.2 ng/ml (P=0.0022) and pretreatment HBV-DNA ≥7.4 log copies/ml (P=0.0061) were found to be significant prognostic factors linked to the HCC development. (A) Cumulative HCC incidence for all cases (n=338). The 3-, 5- 7-year cumulative HCC incidence rates in all cases were 4.4%, 9.2% and 13.5%, respectively. (B) Cumulative HCC incidence in the high-FIB group (FIB-4 index ≥3.666, n=83) and the low-FIB group (FIB-4 index <3.666, n=255). The 3-, 5- 7-year cumulative HCC incidence rates were 11.26%, 25.28% and 32.10%, respectively, in the H-FIB group, and 2.09%, 3.99% and 7.48%, respectively, in the L-FIB group (P<0.0001). (C) Cumulative HCC incidence in the H- APRI group (APRI ≥0.786, n=188) and the L-APRI group (APRI <0.786, n=150). The 3-, 5- 7-year cumulative HCC incidence rates were 6.63%, 13.37% and 18.49%, respectively, in the H-APRI group, and 1.45%, 3.71% and 6.85%, respectively, in the L-APRI group (P=0.0027). Univariate and multivariate analyses of factors contributing to HCC development. OR; hazard ratio, CI; confidence interval, LC; liver cirrhosis, AST; aspartate aminotransferase, ALT; alanine aminotransferase, APRI; AST to platelet ratio index, AFP; alpha-fetoprotein, HBV; hepatitis B virus. Since FIB-4 index derived from age, AST, ALT and platelet count and APRI derived from AST and platelet count, we further performed univariate and multivariate analyses after excluding age, AST, ALT and platelet count from analysis. In multivariate analysis, the following variables were associated with HCC incidence: presence of LC (P=0.0311), FIB-4 index ≥3.666 (P=0.0062), pretreatment AFP ≥13.2 ng/ml (P=0.0318) and pretreatment HBV-DNA ≥7.4 log copies/ml (P=0.0045). The ORs and 95% CI of these significant variables were presented in table 3. 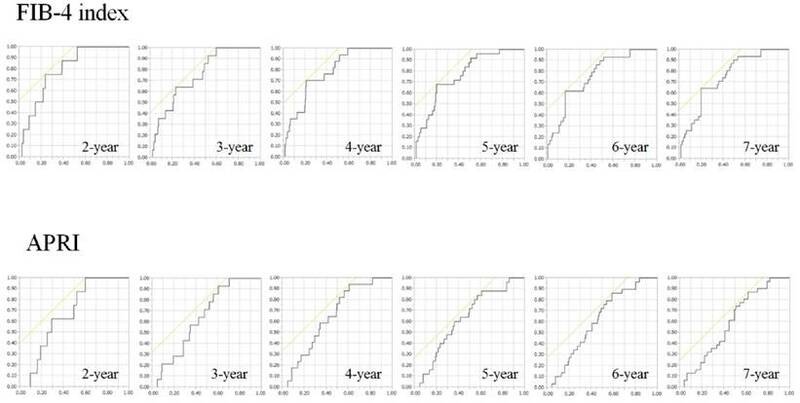 Results for time-dependent ROC analyses at 2-, 3-, 4-, 5-, 6- and 7-year of FIB-4 index and APRI in all cases were shown in fig. 2 and 3. All AUROCs of FIB-4 index in each time point were higher than those of APRI, suggesting that FIB-4 index had superior predictive ability for HCC incidence over APRI. Results for time-dependent ROC analyses at 2-, 3-, 4-, 5-, 6- and 7-year of FIB-4 index and APRI in patients with LC (n=91) were shown in fig. 4A. All AUROCs of FIB-4 index in each time point were higher than those of APRI. 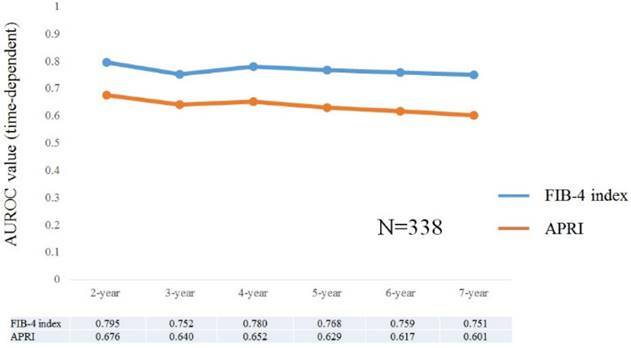 Similarly, data for time-dependent ROC analyses at 3-, 4-, 5-, 6- and 7-year of FIB-4 index and APRI in patients without LC (n=247) were demonstrated in fig. 4B. None in patients without LC developed HCC within 2 years after the start of ETV therapy. All AUROCs of FIB-4 index in each time point were higher than those of APRI. Results for time-dependent ROC analyses at 2-, 3-, 4-, 5-, 6- and 7-year of FIB-4 index and APRI in patients with HBe antigen positivity (n=163) were presented in fig. 4C. All AUROCs of FIB-4 index in each time point were higher than those of APRI. Likewise, data for time-dependent ROC analyses at 2-, 3-, 4-, 5-, 6- and 7-year of FIB-4 index and APRI in patients without HBe antigen positivity (n=175) were shown in fig. 4D. All AUROCs of FIB-4 index in each time point were higher than those of APRI. Results for time-dependent ROC analyses at 2-, 3-, 4-, 5-, 6- and 7-year of FIB-4 index and APRI in patients with HBV-DNA ≥7.4 log copies/ml (n=103) were shown in fig. 5A. All AUROCs of FIB-4 index in each time point were higher than those of APRI. In the same way, data for time-dependent ROC analyses at 2-, 3-, 4-, 5-, 6- and 7-year of FIB-4 index and APRI in patients with HBV-DNA <7.4 log copies/ml (n=235) were presented in fig. 5B. All AUROCs of FIB-4 index in each time point were higher than those of APRI. Data for time-dependent ROC analysis. Plots of annual AUROCs of FIB-4 index and APRI for HCC incidence after ETV therapy for all cases (n=338). ROC curves for FIB-4 index and APRI at 2-, 3-, 4-, 5-, 6- and 7-year time points. Vertical axis indicates sensitivity and horizontal axis indicates 1-specificity. Subgroup analyses. 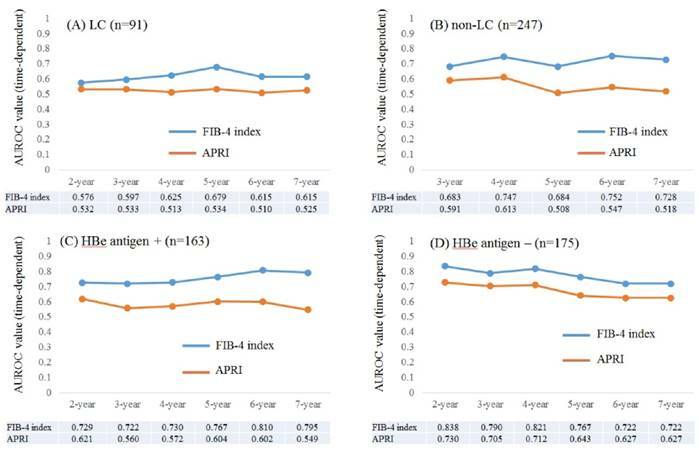 Plots of annual AUROCs of FIB-4 index and APRI for HCC incidence after ETV therapy for patients with LC (n=91) (A) and without LC (n=247) (B). No patient in non-LC developed HCC within 2 years after the start of ETV therapy. Plots of annual AUROCs of FIB-4 index and APRI for HCC incidence after ETV therapy for patients with HBe antigen positivity (n=163) (C) and without HBe antigen positivity (n=175) (D). Subgroup analyses. 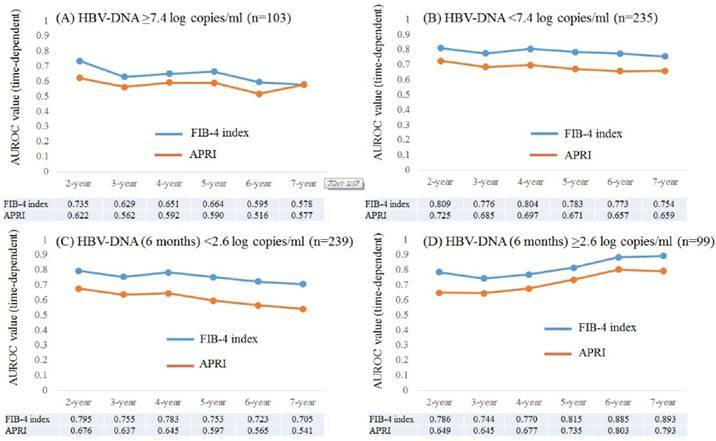 Plots of annual AUROCs of FIB-4 index and APRI for HCC incidence after ETV therapy for patients with HBV-DNA ≥7.4 log copies/ml at baseline (n=103) (A) and HBV-DNA <7.4 log copies/ml at baseline (n=235) (B). Plots of annual AUROCs of FIB-4 index and APRI for HCC incidence after ETV therapy for patients with HBV-DNA <2.6 log copies/ml at 6 months (n=239) (C) and HBV-DNA ≥2.6 log copies/ml at 6 months (n=99) (D). Results for time-dependent ROC analyses at 2-, 3-, 4-, 5-, 6- and 7-year of FIB-4 index and APRI in patients with HBV-DNA (6 months) <2.6 log copies/ml (n=239) were shown in fig. 5C. All AUROCs of FIB-4 index in each time point were higher than those of APRI. Likewise, data for time-dependent ROC analyses at 2-, 3-, 4-, 5-, 6- and 7-year of FIB-4 index and APRI in patients with HBV-DNA (6 months) ≥2.6 log copies/ml (n=99) were demonstrated in fig. 5D. All AUROCs of FIB-4 index in each time point were higher than those of APRI. To the best of our knowledge, there have been no reports regarding the comparison of effects of FIB-4 index and APRI on HCC incidence in CHB patients undergoing ETV therapy. Although FIB-4 index and APRI can be easily calculated by routine laboratory blood tests and are well established non-invasive liver fibrosis markers, whether these markers can be helpful for predicting HCC incidence for CHB patients treated with ETV remains an unsolved problem. [25, 29, 30, 35] Additionally, despite the fact that most disease clinical outcomes are time-dependent, no previous reports have performed time-dependent ROC analysis to fully assess the clinical implication of non-invasive liver fibrosis markers in terms of HCC incidence for CHB patients undergoing ETV therapy. We therefore performed this investigation. A notable strength in this study is the homogenous Japanese CHB patient cohort, which eliminated the confounding effects of patient ethnicity. The correlation between HBV-DNA level at baseline and future risk for HCC is one of recent major progresses in our understanding for the natural clinical course of CHB infection. In our results, higher HBV-DNA level at baseline was significantly linked to HCC incidence, which are in line with previous reports. On the other hand, Tada, et al. demonstrated in their large cohort that HB core related Ag (HBcrAg) was superior to HBV-DNA for predicting HCC incidence. The comparison of FIB-4 index and HBcrAg in terms of prognostic impact for HCC incidence in CHB patients could be a point of focus in the future. Notably, in patients with HBV-DNA at 6 months ≥2.6 log copies/ml, AUROC in time-dependent analysis at 5-, 6- and 7- years of FIB-4 index were more than 0.8. These results indicated that in patients with poor response to antiviral therapy in the early stage, the effect of FIB-4 index for predicting carcinogenesis is prominent in the later stage of the follow-up period. Especially in patients with poor early response to ETV and higher FIB-4 index at baseline, closely regular HCC surveillance will be required. HBV-related HCC may develop in non-LC patients. In our analysis, out of 33 patients with HCC incidence, 11 patients (33.3%) had non-LC status. The median time interval for the date of ETV therapy to the date of first confirmed HCC incidence in these patients was 4.26 years. These results support the notion that HBV itself plays a direct role in the liver transformation by triggering carcinogenic pathways. It should be noted for clinicians that HBV contributes to development of HCC through these direct mechanisms and liver fibrosis related indirect mechanisms, although this is beyond the aim of our study. There are limitations to our study. Firstly, as our study findings were limited by the retrospective nature of our study design, we should interpret our study data with caution. Secondly, as our study subjects were limited for patients initially treated with ETV, whether our results could be applied to CHB patients receiving other NAs needs further research. Thirdly, as the study subjects were all recruited from Japanese patients, generalizability of this study findings to patients with other ethnicities remains to be evaluated. Finally, we did not have sufficient numbers of HCC incidence for analysis, potentially leading to bias. Thus, future well designed larger studies will be needed to consolidate our results. However, despite the aforementioned study limitations, our current results presented that FIB-4 index was superior to APRI for predicting HCC incidence in CHB patients undergoing ETV therapy. In conclusion, FIB-4 index rather than APRI can be a useful predictor associated with HCC development for CHB patients treated with ETV. An emphasis is warranted for the easy and prompt clinical utility of FIB-4 index for predicting HCC incidence as well as the degree of liver fibrosis. HCC: hepatocellular carcinoma; CHB: Chronic hepatitis B; HBV: hepatitis B virus; HBs: hepatitis B surface ALT: alanine aminotransferase; LC: liver cirrhosis; AASLD: The American Association for Study of Liver Disease; ETV: entecavir; NAs: nucleoside analogues; AST: aspartate aminotransferase; APRI: AST to platelet ration index; ROC: receiver operating characteristic curve; AUROCs: area under the ROCs AFP: alpha-fetoprotein; OR: odds ratio; CI: confidence interval; HBcrAg: HB core related antigen. The authors would like to thank Nozomi Kanazawa (Hyogo college of medicine), Yoko Matsushita (Hyogo college of medicine), Sayaka Fujii (Hyogo college of medicine) and Haruko Takada (Osaka Red Cross hospital) for data acquisition. Hiroki Nishikawa, Norihiro Nishijima and Hirayuki Enomoto analysed data and wrote the paper and other remaining authors collected data. In the present study, the authors declare that they have no conflicts of interest. Corresponding author: Hirayuki Enomoto, MD, PhD, Department of Hepatobiliary and Pancreatic disease, Department of Internal Medicine, Hyogo College of Medicine, Hyogo, Japan. 1-1, Mukogawacho, Nishinomiyashi, Hyogo, 663-8501, Japan. Tel: +81-798-45-6111; Fax: +81-798-45-6608 E-mail: enomotoac.jp.